Tkinter ("Tk Interface")is python's standard cross-platform package for creating graphical user interfaces (GUIs). It provides access to an underlying Tcl interpreter with the Tk toolkit, which itself is a cross-platform, multilanguage graphical user interface library. Tkinter isn't the only GUI library for python, but it is the one that comes standard. Additional GUI libraries that can be used with python include wxPython, PyQt, and kivy. Tkinter's greatest strength is its ubiquity and simplicity. It works out of the box on most platforms (linux, OSX, Windows), and comes complete with a wide range of widgets necessary for most common tasks (buttons, labels, drawing canvas, multiline text, etc). As a learning tool, tkinter has some features that are unique among GUI toolkits, such as named fonts, bind tags, and variable tracing. Tkinter is largely unchanged between python 2 and python 3, with the major difference being that the tkinter package and modules were renamed. 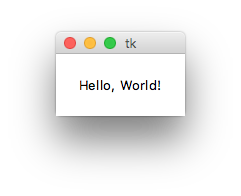 Let's test our basic knowledge of tkinter by creating the classic "Hello, World!" program. Using as tk isn't strictly necessary but we will use it so the rest of this example will work the same for both version. This will open and run the application until it is stopped by the window being closed or calling exiting functions from callbacks (discussed later) such as root.destroy() . Note: It's possible to inherit from just about any tkinter widget, including the root window. Inheriting from tkinter.Frame is at least arguably the most flexible in that it supports multiple document interfaces (MDI), single document interfaces (SDI), single page applications, and multiple-page applications. Tkinter comes pre-installed with the Python installer binaries for Mac OS X and the Windows platform. So if you install Python from the official binaries for Mac OS X or Windows platform, you are good to go with Tkinter. For Debian versions of Linux you have to install it manually by using the following commands. You have successfully installed Tkinter, if the above command executes without an error. Note: Importing Tkinter as tk is not required but is good practice as it helps keep things consistent between version.